Quezon City – Everyone loves music, regardless of what culture we are from. We all have at least one song that evokes emotions when we listen to it; it either boosts our mood at that particular moment or transports us back to a challenging period in our life. Filipinos are very fond of music and hardly ever say no to singing, which makes everyone seem born with a song in their hearts. Long before the Spaniards arrived in the country, indigenous peoples have already possessed their own native music. It functioned as a form of entertainment during occasions such as weddings, festivals, inaugurations, as well as funerals. Musical styles vary among regions, as each of the more than a hundred ethnic groups scattered in the islands of Luzon, Visayas, and Mindanao produces its own lyrics and music. Indigenous or traditional music is accompanied by musical instruments like string, wind, and percussion, which are typically made of bamboo, wood, or metal. Flutes, pipes, and panpipes are wooden or bamboo-finished products, while gongs or gangsa are constructed from metal. Different singing techniques are applied between the people up north and inhabitants of the south, the former with more rhythmic expressions and the latter with long melodic phrases. Among the most common traditional music instruments used are kudyapi, kulintang, gimbal, kubing, and tongali. 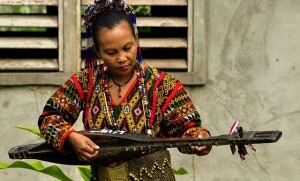 Kudyapi is a two-stringed lute native to the Lumads in Mindanao. It is made out of a single piece of wood and used by the Manobo, T’boli, Maguindanao, and Maranao. Kulintang or the gong ensemble is composed of different sets of knobbed gongs aligned horizontally and arranged according to pitch. It is used by the Tausug, Maranao, and Maguindanao for entertainment during festivals and weddings. The widespread practice of kulintang in the Southern Philippines came before the influence of Islam or Christianity in the archipelago. Headhunting activities are associated with gimbal, or war drums created from a hollow tree trunk and covered with animal skin on both ends. Several ethnic groups in eastern Mindanao, such as the Mansaka and Mandaya, also used the same exact instruments. It is played at dances as a complement to gongs. A comparable instrument is also used up north in the Cordilleran region and is called sulibao by the Ibalois and kimbal by the Bontoc. Kubing, a type of bamboo jew’s harp, is famous around the Philippines and is used for courtship or when trying to convey a message to one’s family and loved ones. It is placed between the lips and produces various sounds when its bamboo tongue is plucked. It is known as barmbaw among the Tagalogs, kinaban among the Hanunoo Mangyans, and kollibaw among the Negritos. A three- or four-holed nose flute called tongali is a traditional instrument used particularly in the mountains of northern Luzon. It is made of bamboo and played by blowing air through the nose. This instrument was believed to help rice grow, as the rice plants are said to be attracted to the soft sound of the flute. It is known as unguing among the Ifugaos, basil among the Kapampangans, and kaleleng among the Bontoc. Two years ago, a group representing the Philippines was awarded in the Asean Cultural Fair in Burma after performing a series of melodic traditional songs. Nonoy Lanzanas and his Sinika, which is an acronym for Sining ng Katutubo, has long composed Philippine ethnic music. A native of Puerto Princesa, Lanzanas has written compositions that promotes traditional music made with tribal instruments. Conservation of the Philippines’ traditional music and instruments is essential for the succeeding generations, as it is proof of our beautiful culture and traditions. Support by the government and cultural institutions are crucial to preserve our traditional music.